Team sports that the whole family can play. It’s no secret that being physically active is good for you. Getting up and moving has a number of health benefits, from a reduced risk of obesity and chronic diseases to better sleep and higher self-esteem. The President’s Council on Fitness, Sports and Nutrition recommends that adults have at least 30 minutes of physical activity each day and children have at least 60 minutes. Team sports offer a fun, structured environment for exercise. Playing sports as a team also teaches the importance of persistence, patience, discipline, and the ability to work and play well with others. It also offers the opportunity to grow closer as a family. There’s a reason why soccer is the world’s most popular sport. All you need to get started is a ball, a patch of grass – and a few players. 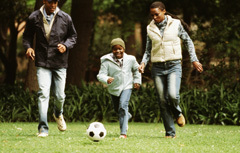 Soccer is an exceptionally family-friendly sport, too. Without cooperation and teamwork, there’s really no way to win. In soccer, the rules can be as easy or as complicated as you want to make them – all some variation of getting the ball into the other team’s goal – so you can tailor the game to include all ability levels. For example, younger children can run after and kick a ball, and older siblings can be charged with teaching them how to play. Soccer also provides a great cardiovascular workout. Disc golf gets everyone into the great outdoors, requires very little equipment and anyone can play. Best of all, most disc golf courses don’t charge to play. Most are set in public parks, and there are more than 5,000 courses across the United States. The game is played much like regular golf, but with a disc and a basket instead of a ball and set of clubs. Players form teams of at least two, and take turns throwing their discs through the course toward a basket. All ages can play; let the little ones throw their discs from closer to the basket. No matter which family fitness options you choose, encourage good sportsmanship rather than a fierce competitive spirit. Remember, the goal is to have a good time and grow together as a family.